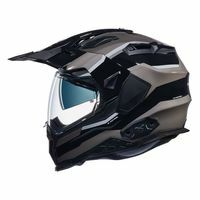 8The X-Wild Enduro marries the comfort of a touring helmet with the ventilation of a dirt helmet to bring you the ultimate ADV lid. Big bikes like to go fast but sometimes the terrain requires calculated and strategic low speed prowess. In these conditions the X-Wild Enduro truly shines. With double the air inlet ventilation in comparison to its predecessor, the X-Wild is does everything it can to keep you cool when you need to keep your cool. At highway speeds, head checks are more of a breeze because the the peak has been engineered to catch less of the breeze. A drop down internal sun visor enables a smooth transition from sunny morning jaunts to dimly-lit evening excursions. $27 Promotional Gift Card available on this product!